Large round pomelos, the Asian equivalent of grapefruit, are generally bitter-sweet, and are eaten as a fruit as well as mixed with sour, spicy ingredients and shrimp or chicken to make a salad. A favorite Thai snack is to just dip segments of pomelo into whatever sauce happens to be available. This salad goes wellwith rice and other cooked dishes. Place the lime juice, fish sauce and sugar in a bowl and stir well to dissolve the sugar. Then add the prawns or shrimp, chicken and grated coconut. Mix well. Add the pomelo or grapefriut and grated coconut. Toss lightly. 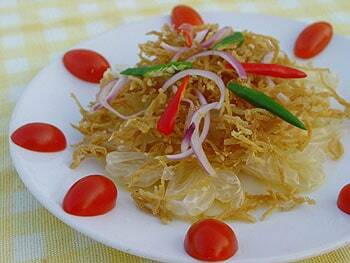 Serve psprinkled with chopped dried shrimp and chili, an ddrizzled with a little coconut cream, if using. Note: If you are using frapefruit, it may be necessary to add extra sugar.